Based on a River Cottage recipe, a chunky soup that's a meal on its own served with good bread. Serves four to six. ..
Mums most excellent Ginger cakes, childhood on the tastebuds ..
Dina's second scone recipe, or one of them at least. Perfect every time with a little practice. 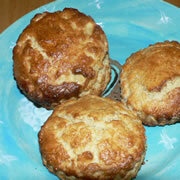 ..
Dina's scone recipe, or one of them at least. Perfect every time with a little practice. .. Very simple apple sauce recipe. Full flavour accompaniment to go with a vegetarian roast dinner. ..
Yacon curry for the slow cooker. I'd grown Yacon for the first time, and come autumn had no idea what to do with it. This is the recipe that came together and is pretty good. Tame enough that the kids ate without complaint too. Yacon has a very mild .. I made this as part of an evening course at college. It is a bit long winded, heavy on eggs, but blimey it is also very, very more-ish. .. The smooth combination of clove, nutmeg and cinnamon gives this dish a really distinctive Malaysian flavour. Serve with boiled rice. ..
A favourite amongst many locals in Malaysia; a spicy & tangy noodle dish complemented by the sweet taste of shrimp and cabbage and cooled with a cucumber garnish. Perfect for lunch or dinner ..
Having the cooked breakfast? Veggie or otherwise. Really nice mushrooms are one of the ingredients that make a cooked breakfast into a fantastic cooked breakfast. This is my method and on the few occasions I’ve had occasion top cook breakfast for fri .. I adapted the recipe to a veggie version from a more traditional lamb recipe; the spices and other ingredients are exact to a recipe that's been passed on for generations. Tweaking it slightly here and there, this is the version that comes out fantas ..
A very authentic tasting Indian Balti recipe. It did require a few spices I don't normally have in the cupboard, but they are all spices I look forward to trying again. ..
One of those wonderful Indian side dishes that go with the Naan breads and anything else for that matter. Exceptionally easy and a great accompaniment. ..
Easy and very lovely side dish for a multitude of Indian Dishes ..
Just the best Naan recipe I've found yet. You can add other fillings to vary it a little; garlic etc. .. Perfect Sag Aloo to accompany a wide range of Indian dishes .. Very light, suet-free dumplings to go with stews and other saucy meals. ..
Nice, easy, straightforward vegetable stew with very light veggie dumplings. Ingredients are very fluid, just use what vegetables you have, or need using up. ..
A slow cooker recipe taken from a book I was given for Christmas. Very tasty, bit longwinded but worth the effort. 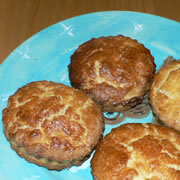 ..
Long winded slow cooker meal, but well worth the effort for special occaisions or a rich treat. .. Very easy, very tasty slow cooker meal. Throw it together in the morning and thoroughly enjoy in the evening. .. Very nice veggie curry, using all the individual spices proves far, far better than any ready to go curry sauce. .. Very tasty biscuit - mini-cake recipe. Great for lunch boxes and party snack dish .. Double yum, I made a double batch and they lasted about an hour. Big thumbs up from all the kids too. .. Either a side dish or starter, tastes fantastic with your own home grown tomatoes. ..
Never having had artichokes, and being given some by a friend, this is the recipe found, tried and thought okay. ..
A lot of effort, but well worth it for a lovelly home made loaf. ..
Really old recipe for a layered chocolate cake. ..
A perfect bread to accompany most Indian dishes. ..